Mistletoe is a parasite commonly found throughout the United States. Specific trees in the Fort Worth area that are infested are Hackberries, Cedar Elms, American Elms, and a host of other tree species. It is commonly spread through birds that eat berries and deposit seed throughout the tree’s canopy. Mistletoe affects the health, structure, and overall beauty of trees. It can cause severe tissue deformation, strength loss, breakage, dieback, reduced growth, reduced flowering and fruiting, increased stress, and susceptibility to other problems which ultimately leads to death. Depending on the amount of infestation mistletoe can have devastating effects on trees. We recommend removal of mistletoe in the dormant season (after leaves have fallen) so that it can be easily seen. With persistence and a yearly maintenance program, mistletoe damage can be controlled or minimized. 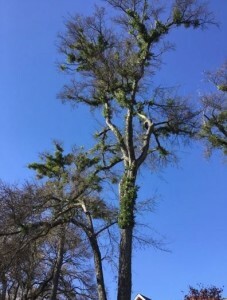 Trees with large mistletoe infestation should be pruned by only seasoned professionals due to the tree’s overall loss of strength and its susceptibility to breakage.